In JungleDocs you can use dynamic view to help sort the information in your SharePoint. In this tutorial, you will learn how to do this. GetView() function is used to resolve items using SharePoint View configuration and allows to use view sorting, grouping, and filtering (static filter). Find Items() function is used to filter items from the list with an “equals” condition specified in the document itself (dynamic filter), but it does not support sorting, grouping or more complex filtering. When sorting or grouping items, more complex dynamic filtering is needed. Here, a GetView() function with dynamic view can be used. 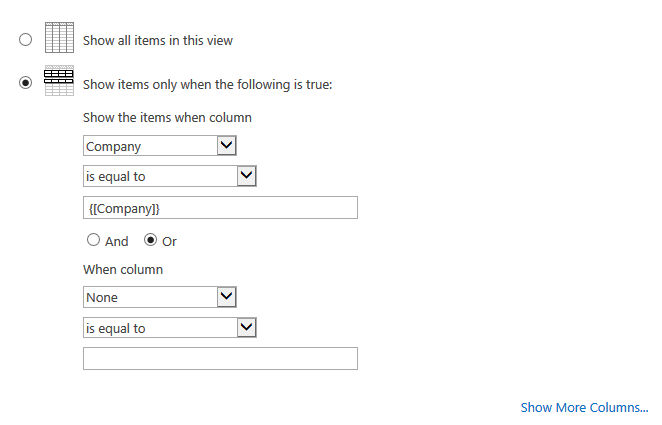 A dynamic view is created via a GetView() function that you can use inside SharePoint view filters. Before applying the filters, JungleDocs will process GetView() function (or any other JungleDocs formulas) and replace them with real values which will be recognized by SharePoint. Note: the context of a GetView() function will be used to process formulas in a dynamic view. In other words, if a GetView() function is used in a document, the document context (metadata) can be used to process the formulas in view filters. This provides the ability to use document columns in formulas. Note: additional filter parameters work only as an equal condition and they should be combined by and operators. 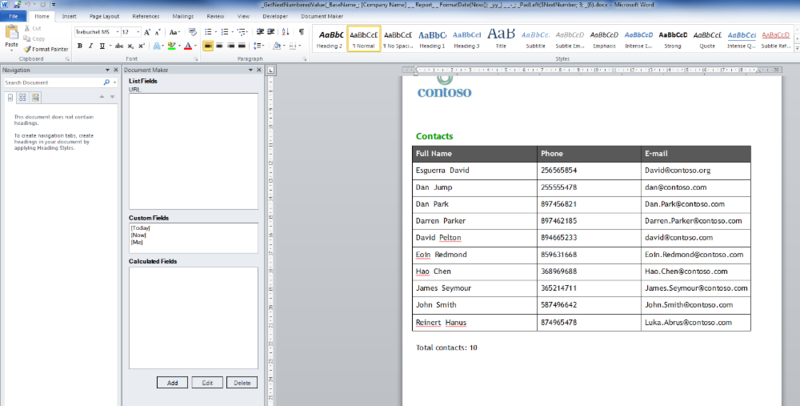 Imagine you have a Companies list, a Contacts list, and a Word Reports library for storing Word reports. The Contacts list has a Company lookup column referring to the Companies list. The Word Reports library also has a Company lookup column referring to the Companies list. Now, let's say you want to create a report that displays a list of contacts for a specified company, and you that report to appear in the Word Reports library. Here's how you do it. 1. First, create a Word document that you will later use as a template for a JungleDocs rule. In the document, use a GetView() function and specify the Contacts list and the Filtered view as parameters: GetView("Contacts";"Filtered"). 2. Create the Filtered view itself in the Contacts list and set a filter on a Company column. In view settings, a value in the Company column must be equal to the Company column in the Word Reports library. 3. In the Companies list, select a company, then open JungleDocs and create a new From Existing rule. 4. Give your rule a name (in our case it's Company Contacts) and set the Word Reports library as a target location (that's where reports will be saved). 5. Select Custom template, then click Manage custom template and upload the template that you've created in Step 1. 6. Save the rule by clicking OK.
You can also apply dynamic view for documents created from Small Parts. Read the tutorial here.